The oars are 12 feet long and weigh around 12 pounds. 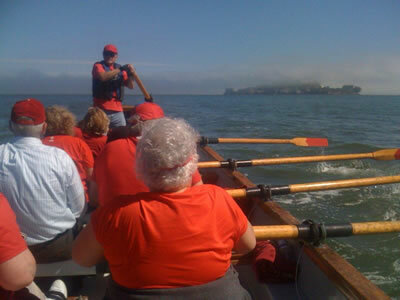 Rowers face the back of the boat (the stern) and pull their oars from back to front. The boat is steered by the coxswain, who uses a longer oar (the sweep) in the stern somewhat like a rudder. At the beginning of the stroke (the catch), rowers lean forward and drop their oar into the water. Pulling back all the way through the water, the rowers lean back and snap the oars into their chest (the release). The stroke is not a circle, but rather a rectangle. See this exciting finish to the Acatraz Whaleboat race. Below, see boats getting ready for Sprint the Pier.